Tomas Tranströmer’s “After a Death” seems a poem written to universalize a human response to a death and yet still to localize it in a Swedish geography. And while one might want to read it as Tranströmer’s own response to a death, of life lived “after a death”, the very title requires you read it at a further distance. It is “a” death, or in another translation, after “someone’s” death. But even more than this, it seems a poem responding to another poem; or rather as a poem offering a change to the angle of vision found in Emily Dickinson’s poem “Death sets a thing significant”. Tranströmer’s poem rather claims that death sets a thing insignificant. Here is the Dickinson. I read this as a pretty straightforward poem that is more intellectual than felt even as it ends in tears. It is a proposition followed by evidence. Death sets a thing into relief; what we “hurry past” as insignificant only gains power over us when it, a thing, a token, a totem even, carries death within it. Here is a piece of human activity so quotidian that it has no meaning until it becomes a memento mori: a remembrance of one’s mortality. In this perhaps we simply weep for ourselves as we consider the absence of others to be a harbinger of our own and consequently our currently insignificant or trivial acts. 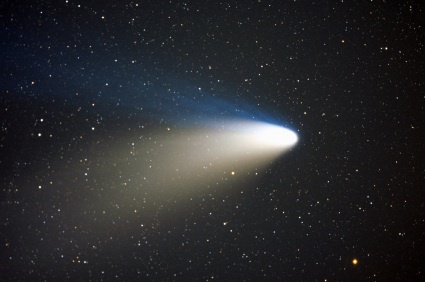 that left behind a long pale glimmering comet’s tail. It contains us. It blurs TV images. It deposits itself as cold drops on the aerials. among groves where last year’s leaves still hang. the names are eaten up by the cold. It is still beautiful to hear your heart throbbing. But often the shadow feels more real than the body. But wait, the poem begins, really, before “once” with the title’s announcement that these thoughts are rendered after a death. This shock is not one of origins but of last things, endings. In just the title and two lines Tranströmer has encouraged significant ambiguity. Also too we must see one cause of this is the sole use of the indefinite article “a”–and generalizing, inclusive pronouns without clear antecedents–”it”, “you” and “they”–and even the “his” in the last line is only there as necessary grammar to match the gender of the samurai. Detachment is the order. I find the next sentence significant as far as translations go. Bly has “It keeps us inside” while Fulton has “It contains us”. Bly seems to want to shift quickly from the celestial distance to the more local geography of the perceived or seen comet as if seeing the comet’s tail is what keeps us home-bound or inside and sheltered. But reading the Fulton you then generously allow the Bly to perhaps mean what Fulton says, “It contains us.” The shock or the comet; the shock of death or the shock of beginnings? Mourning can keep us hidden; we shrink from the world within our grief. In this way it keeps us inside and also contains us. The figuration of a shock that leaves behind not a comet but a comet’s tail is somewhat startling and perplexing because there is the sense of permanence to the idea, as if it’s left it there to stay, but how can a comet or a comet’s tail be fixed? Also, a comet’s tail is water (shimmering/glimmering ice) but also the dust of the stars. It is the stuff of life, of origins and in this our very being, our molecules and atoms are “contained”. Tranströmer appears to offer the reader a humanizing life-line that serves as a kind of tether to the modern artifact of a “snowy” TV or a TV with blurred images. This image is “of us” yet it is used to declare a kind of interference of reception. We are no longer receiving clear signals and the stuff of the comet’s tail is the reason for the blur as it gathers on the “aerials”. In Bly it gathers on telephone lines (another figuration for human messaging) while Fulton keeps the TV association with aerials (television antennae). The middle stanza brings us further into the singular and human world, one in which we can readily see the poet as actor. “You” go about the normal things–cross-country skiing–but these activities only continue to offer the receiver of the shock further ways to envision insignificance: he brushes the dead leaves still hanging on trees and compares them to pages torn from old telephone directories. “Old” here implies distance again but now of time rather than space (are they different?). But still he keeps us among the countless or numberless numbers–the “names eaten up (or swallowed) by the cold” are just names and as insignificant as the leaves already fallen and those stubbornly attached already dead; present to us, but already gone. Finally, we might even imagine warmth allowed into the poem as beauty is figured as a throbbing heart. But is it “yours” as in a companion or is it simply a self-reflexive pronoun? It is beautiful that I am still alive. BUT…the shadow is more real than the body. Because it is always past and always future? What you were is gone, what you will be is absent. You occupy always this shadow land called living. And we end with a further distancing; the human idea of defining classes and defining our ways of life in our words and labels is encapsulated in “samurai”–it gives us geography and the time-line of human history. But this name, proper as it is, is like those in the directories, eaten up by time and space. And the name itself is as evanescent and less “material” than not only the body of the samurai but also the armor of the culture that gives it meaning. When Tranströmer closes the tight yet all-encompassing circle with the dragon, once a mighty mythical, magical creature by reducing it to a piece of human armor the snake of his figuration eats its tail; the scale of armor is a scale of measure and the comet’s tail, it’s significance as a portent, or harbinger and perhaps its confounding with the dragon has been reduced to such a scale as to be measured in this three stanza poem. Wherein Dickinson has Death set a thing significant; Tranströmer has a Death set all things insignificant, even the first things that begin our poetry and fevered imaginings in attempting to put words to the ineffable; to make sense is the only inescapable human need. A gift and curse of Hermes. Perhaps a poet has only one subject (“repeated without end”) and, as long as there can be found new words and forms, the subject will keep composing verses through him. erect among glittering spines of fish. Compare the imagery in the two poems here and you will find exquisite reiteration: a heart, a shadow, snow, a dream landscape, and a mooring line. Dislodged Giant: Can We Use Stevens to Interpret Dickinson?